I worried that it was possible for the symbolic and inspirational aspects of having a black president more than offset by the damages that could be done by the messages delivered by a black president. And it has been damaging to have Barack Obama, a black man speaking from the authoritative platform of the presidency, reinforce the widely held belief that racial inequality in the United States is, in large measure, the direct responsibility of black folk. This has been the deal breaker for me: not merely a silence on white physical and emotional violence directed against black Americans, but the denial of the centrality of American racism in explaining sustained black-white disparity. William A. Darity, "How Barack Obama Failed Black Americans," The Atlantic, December 22, 2016. https://www.theatlantic.com/politics/archive/2016/12/how-barack-obama-failed-black-americans/511358/. Actor-producer Fanshen Cox DiGiovanni brought her one-woman show, “One Drop of Love,” to the Cambridge Rindge & Latin School on Friday night. The play, co-produced by famous Rindge alums Ben Affleck and Matt Damon, is about family, race, class, and reconciliation. 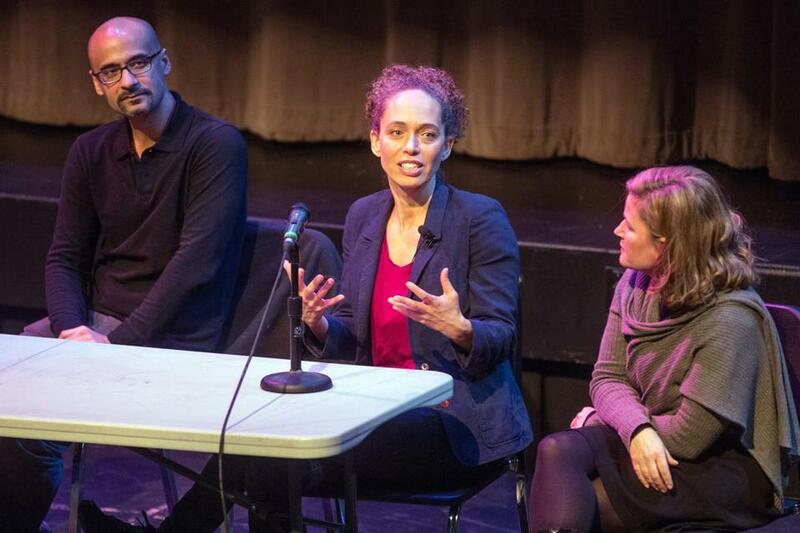 DiGiovanni stuck around to talk about the big themes with a panel that included Pulitzer-Prize-winning author and MIT professor Junot Díaz and educator Donald Burroughs. The evening benefited the school’s Kimbrough Scholars Program. This entry was posted	on Tuesday, February 3rd, 2015 at 20:30Z	and is filed under Articles, Arts, Media Archive, United States. You can follow any responses to this entry through the RSS 2.0 feed. Both comments and pings are currently closed.